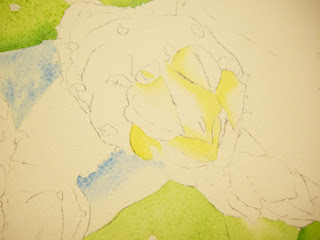 Today I am adding some yellows. I have used Aureolin Yellow to begin to develop the areas in the flower heads that will become yellow-orange. Be careful where you apply colors - they should not go EVERYWHERE! Soften some edges by pulling water into the stroke. I call this my Softened Edge Stroke. First lay down a stroke of color, very wet, yet strong with pigment. Then, clean your brush and load it with water. Just touch the tip of your brush to your paper towel to remove excess water that may drip. Pull a stroke of water from the blank area into and alongside the stroke you just applied. It is important to do this BEFORE the stroke dries. 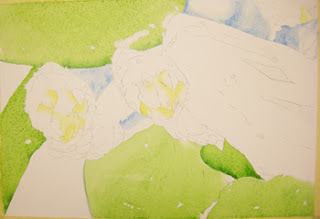 Pulling water into the stroke will push the pigment into the area that already has color. If you pull the water from the stroke out to the blank area, the stroke will just be diluted and the pigment will wash out to the blank area. The goal is to create a very soft transition from dark color to nothing (clear water). This takes practice. Be easy on yourself and remember that it is just a piece of paper! With practice you will master the many different techniques!